Every year, MoMA PS1 gives a young architect $100k to build an experimental party pavilion—read: a shading device for events—in the gravely courtyard of its Queens arm. This weekend, the museum unveiled this year's space: A 38-foot-tall wall fabricated out of scraps from an Ithaca skateboard factory. MoMA's Young Architects Program has been around for 14 years, and it’s incurred equal amounts of praise and criticism. On the one hand, the program gives “young" architects a chance to build radical things. On the other hand, its curators typically choose proposals that will clearly cost more than the $85,000 budget—meaning that some applicants stick within the budget and others submit more expensive schemes on the assumption that they can raise funds to cover the difference. Partywall, as this year’s installation is called, is a pun on “partiwall" (or the more commonly used "party wall"), a term describing the wall shared between two buildings. In this case, there are none; the steel framed wall slices through empty air, terminating at the ground floor in a v-shaped frame, where giant PVC balloons filled with water anchor the whole thing to the ground. 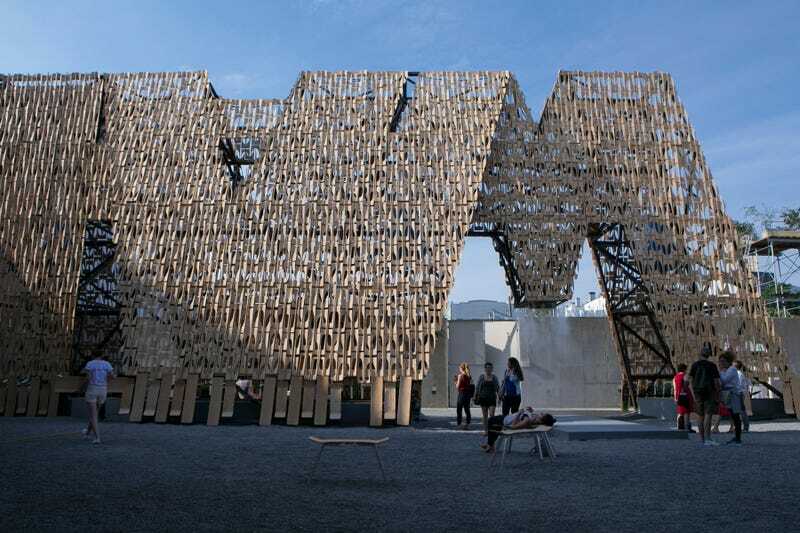 The main defining feature is its facade, which is woven from 3,000 “bones” and “blanks,” the waste product of skateboard manufacturing. The Ithaca-based architects behind Partywall, Coda, collaborated with local sustainable skateboard company, Comet, to source the scraps. Of course, trucking 3,000 pieces of wood from Ithaca to Queens seems like it would cancel out whatever environmental savings were incurred by using discarded waste material. I got in touch with Caroline O’Donnell, the Ireland-born founding principal of Coda, to find out—and as she explained, the process of using the discarded wood ended up being incredibly complicated. “We had to prefabricate the 3,000 skateboard bones into 150 panels,” she said. “We had volunteers work at what we called ‘Skateboard Saturdays,’ every Saturday since January. Construction on site in five weeks would not have been possible otherwise.” What’s more, it was faster to use leftover scraps from longboards rather than regular skateboards (since fewer pieces were required), and the type they needed are only made in Ithaca. So what began as a way to reuse waste evolved into a much more complicated fabrication process. But working through issues like this are the whole point of YAP. It’s a learning process. Building things is a complicated undertaking. Images by Charles Roussel via Designboom. Construction images courtesy Zachary Tyler Newton via ArchDaily.